Circle up in style with the SoftZone Crescent Stool Set with Teacher Stool from ECR4Kids! 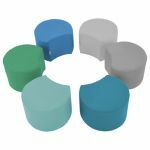 This 7-piece set includes six soft foam crescent stools for kids, plus one taller oval seat for a teacher or other adult. 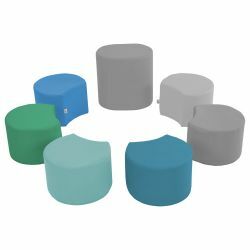 This furniture set is great for circling up for story time or group activities in classrooms, daycares, preschools and homes. When stools aren't in use, they nestle around teacher stool to create an attractive flower-like arrangement. 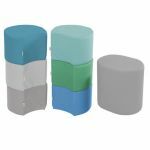 The soft, colorful polyurethane covers are durable and easy to maintain—just wipe clean with mild soap and water solution. Available in assorted colors from your choice of attractive color palette: Primary, Contemporary or Earthtone. Recommended for children 4 years - 6 years. No assembly required. 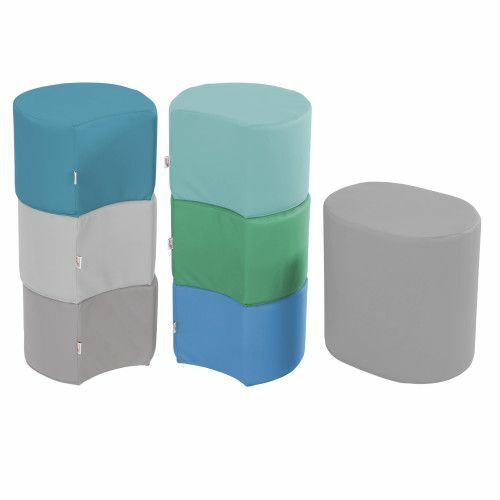 Crescent Stool Set is phthalate-free and has achieved GREENGUARD [GOLD] Certification, is CPSIA-compliant for safety and adheres to CA-117 requirements for fire retardancy. With a concentration on the Pre K-12 sector, ECR4Kids offers a wide range of products including classroom tables and chairs, preschool rest time solutions, hardwood storage cases, blocks and manipulative, mobile organizers and a variety of indoor and outdoor play structures.